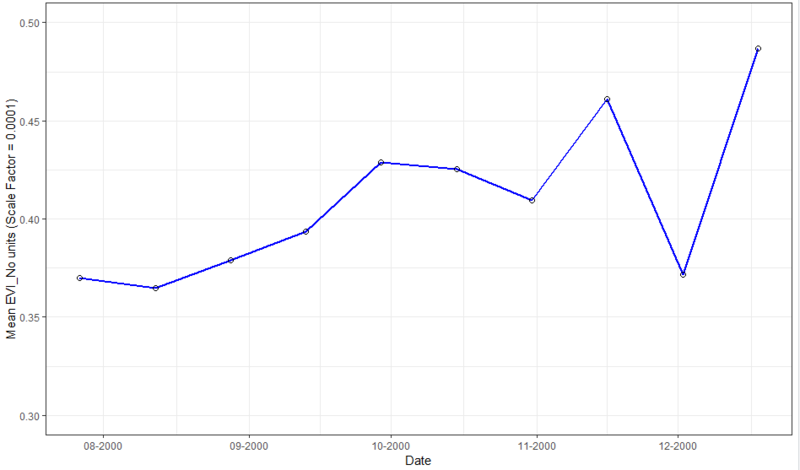 I am using R language and I would like to create a EVI MODIS time series plot, EVI vs time. I can did method to create a raster stack and plot the average EVI of the total area over time. But I would like to plot for a select polygons : 140 polygons with centroid or lat/long coordinate for centroid for polygon) within the area. # What are the classes of the two columns now? but is not a good idea i need a simple method to plot times series for my polygon within the area. I know I can us extract::raster but I don't know how and where can I write this line of script !? i have idea if i do vector to raster to my polygons and i do mask and i multiply the mask with my raster stack and calculate sum for all raster stack after and plot it but i don't know how i can do this script. Can you help with an explanation and example of what I need? I know my script is not good but I am trying. You partitioned your code in a way that obscures what object types you are actually using and what led you to the point that you are stuck. In the future please try to clarify your question before asking, ideally providing example data (note; we do not care about a picture of your polygons). Also, please include the package dependencies, and all of your code that generated your objects. In trying replicating your code I found that in the call to ggplot you nested the date_format function which is from the scales package. We should not have to track this type of thing down in order to provide you help. Your problem is quite easy to address with the raster::extract function. First, lets create some example data consisting of a stack of 12 [-1 to 1] rasters and two corresponding polygons. Now, we can extract the underlying raster values for each polygon, at each time-step. By passing an argument to the "fun" argument we can collapse the raster values to a summary statistic for each polygon. The data is ordered meaning each row of the resulting matrix corresponds to the corresponding polygon (ie., row 1 in the matrix corresponds to polygon 1). You can use ggplot to present the results however, in my example I am using the base plot function to iterate each polygon and plot the timeseries. Note that I am pulling the row from the r.med object. Not the answer you're looking for? Browse other questions tagged r polygon modis evi or ask your own question.